Everybody in the bar except Dan and Bart. Three! Dan. That goes for me, too! Bart. (To Dan) I think we done shot the wrong person. Mayor. He can’t die. He ain’t got no license. Max. (Delighted with the unexpected prospect of a undertaker's fee) What a horrible tragedy! Max. Somebody help me toss him in a coffin. Kitty. I think we should make sure he’s dead first. Sammy. (Sitting up) Am I dead? Sammy. Maybe I ain’t dead. Dan. Could be he ain’t dead. Fiona. He don’t look dead. Kitty. (To Sammy) Where’d they get you, old timer? Sammy. Right here ... in the saloon. Fiona. She means where did you get shot? Kitty. (Cutting him off) There ain’t much blood. How are you feeling? Charlie. (Crosses around L end of bar, to just above Kitty) He don’t look too good. Mayor. He never looked too good. Sammy. I think I’m going fast. Fiona. Before you go, do you need a will? Sammy. I’d prefer a drink. Kitty. (To Sammy) Don’t look a gift horse in the mouth. Sammy. ... Just in case it’s a long trip. Kitty. (Give him a disapproving look) Use the cheap stuff, Charlie. Charlie. One “Old Rot Gut” double coming up. Charlie. (Crosses to Sammy. Kitty fades at bit USL) Here ya go, Sammy. Sammy. (Gulping drink down) Can I have another? Kitty. (A step toward Sammy) Wait a minute! Sammy. ... Just to replace any missing blood. Kitty. All right, Sammy. Charlie, get him another. Charlie. You want I should water it down? Dan. (Crossing a step or so to Sammy) I’m real sorry, old timer. Bart. (He takes a step or two toward Sammy; Kitty counters L) Me, too. Charlie. (Crossing to Sammy’s L shoulder) Here ya go, Sammy. Mayor. (Rising in place) Not half as sorry as you gonna be. Dan. We had our license. Fiona. Your license doesn’t cover this. Mayor. The people of this here metropolis only licensed you to exterminate each other. Kitty. You boys had better get out of town, pronto. Kitty. Cause Sammy’s got two big brothers, Deuce Sluice and Moose Sluice. And they ain’t gonna like this. Dan. Deuce Sluice and Moose Juice? I never heard of them. Mayor. (He crosses to Dan. Max counters) You’ve never heard of Two Gun Sluice? Max. (He crosses to Bart) When Deuce comes in, I’ll be delighted to introduce you. Bart. Hold on a second. Which one is Two Gun Sluice? Fiona. Boy, is that a dumb question. Dan. You wouldn’t think so, if he were after you. Kitty. (Crossing in to Bart’s L side) Deuce means two. Bart. Just like in poker! Fiona. They call him “Deuce” because he carries two guns. Bart. Now I get it. They call him Two Gun Sluice because he carried two guns. Dan. Right. But why do they call him Deuce? Mayor and Fiona. Because he carries two guns! Dan. Don’t that make four? A farce set in the old west. Two miners who would go to dueling - if either could only count to "three." A saloon proprietress more worried about damage to her fancy mirror than the carcasses of her patrons. 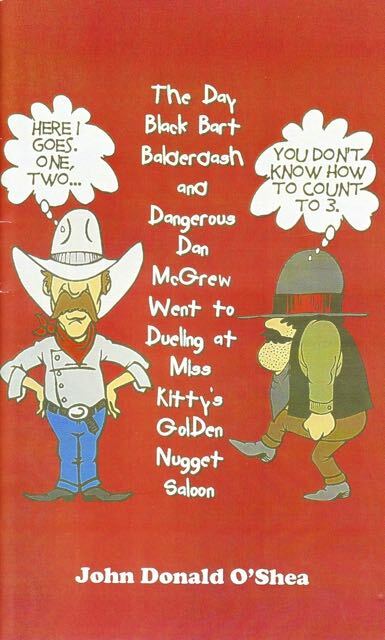 When Dangerous Dan McGrew and Black Bart Balderdash, partners in prospecting for gold, decide to play a friendly game of cards in Miss Kitty’s Golden Nugget Saloon, the boys go for their guns when Bart accuses Dan of cheating. duel is repeatedly interrupted by the other well-meaning citizens of the town, who offer the boys everything from wills, to dueling and larceny licenses, and to prepaid funeral services. The fact that the duel is to commence on the "court of three," turns out to be one further stumbling block when it becomes clear that Dan can't count to three. Hilarious situations and characters abound in this fast-paced farce. Cast: 4 M, 4 F, 5 "eithers." The Setting: The Golden Nugget Saloon. Time: One day in the Old West. A Gold Miner, and Dan's partner. A Gold Miner, and Bart's partner. Sammy's big Brother; Meanest Guy in town.